This review first appeared in the February 19, 1993 issue of the North County Blade-Citizen (now North County Times). One of the most exciting progressive jazz combos since Miles Davis' various sidemen formed Return to Forever and Weather Report some two decades ago, the Petite Blonde quintent's new live recording features the same up-tempo, energetic fusion jazz as those two '70s combos. 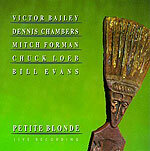 Composed of bassist Victor Bailey, drummer Dennis Chambers, keyboardist Mitch Forman, guitarist Chuck Loeb and saxophonist Bill Evans, Petite Blonde's hard-driving performance can cause even listeners to break out in a good sweat. The band is always melodic, never allowing exuberance or imagination to get out of control. At the same time, as soloists the give musicians continually push each toher further and further, until each song reaches a crescendo of ideas. It's pretty heady stuff, and a heck of a lot of fun to listen to.